This post was supposed to be a review of this new cookbook, but pretty much everything I tried to do in the kitchen tonight went awry. The plan was to make a quick soup and a hearty loaf of bread, both mainstays in the book, but the plan was not to be achieved. All the fuss started with the bread – even though I carefully weighed out all the ingredients, that dough was not going to become “smooth and elastic” by the power of my two hands alone. Not ever. After about 40 minutes of fruitless kneading, I dumped 2 extra cups of flour into the bowl, worked it in, and called it a day. Since I had already gone way off book, I pretty much disregarded the rest of the instructions for the bread after this point as well. It’s baking now – it smells good, but I’m imagining the texture will be less than perfect. I just don’t have the patience (or upper body strength, apparently) for bread baking. Perhaps I should continue to leave that and other long term cooking projects to the very patient Trevor. Having washed my hands of the bread (literally, it took about 5 minutes to get all the dough out from between my fingers, and I still have little crusty bits stuck to my arm hairs. TMI, I know. But ouch.) I moved on to the soup. Since I was already frustrated, when I read that the soup was a “add all the ingredients at once and cover with water” sort of recipe, I decided that I didn’t want to follow those instructions either. 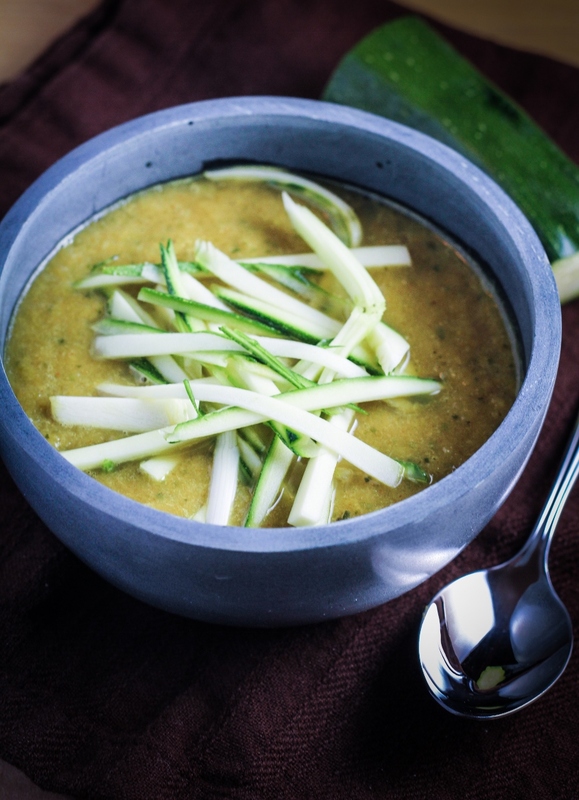 I wanted a soup with leeks cooked in a fragrant curry butter, with the richness of chicken broth backing up the veggies. So that’s what I made. I still had lots of struggles with various kitchen implements – I tried to use a mandoline for the first time to make zucchini ribbons, and I couldn’t even figure out how to operate it, despite the three pages of instructions. Then I went to blend the soup and my immersion blender splattered hot soup all over my clean shirt (and clean kitchen). I almost threw the pot at the sink in frustration. But then I took the first bite of this soup, and man! It was so good! 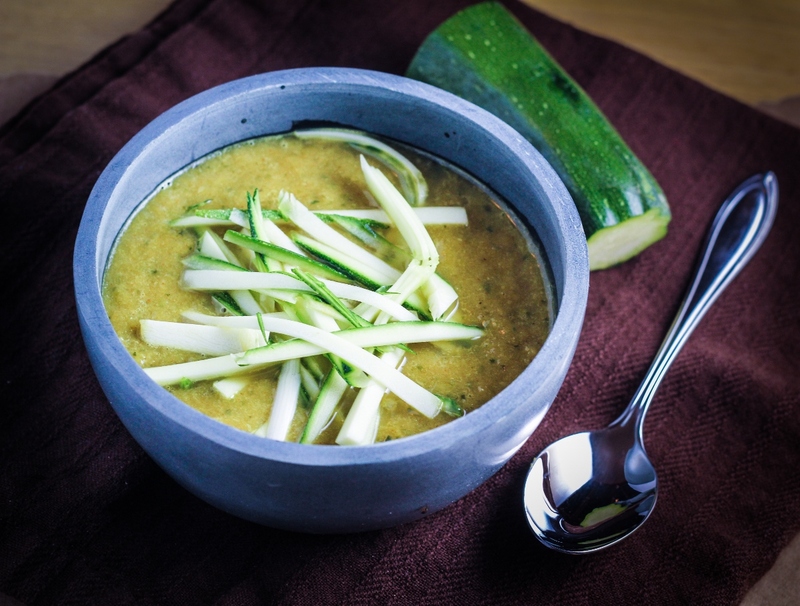 For only five ingredients – butter, leeks, zucchini, curry powder, and chicken broth – it was wonderfully flavorful and rich and smooth, with just the right amount of heat and spice. I loved it. And I felt somewhat redeemed for having struggled so much with the execution of everything. And I knew that I still had something worthwhile to share with you. Adapted from Le Pain Quotidien. Serves 2. Melt the butter in a large pot over medium heat. Add the sliced leek and the curry powder and saute for 2-3 minutes. Chop 1 and 1/2 of the zucchinis into 1 inch pieces, reserving the remaining half a zucchini for garnish. Add the chopped zucchini to the pot and saute until leeks are tender, about 3-5 minutes longer. Add the chicken broth to the pot and bring to a boil. Keep at a low boil until veggies are tender, about 10-15 minutes. Remove from heat, and puree using an immersion blender. Taste for seasoning. Cut the remaining half of a zucchini into long thin strips. Use these as garnish on the warm soup. Katie, If you don’t already have one, invest in a Kitchen Aid mixer with a dough hook. They are amazing and take all the work out of making your dough smooth and elastic. And just throw that stupid mandoline out (is it the one I gave you?). Knives are so much easier and don’t come with instructions. Wine helps make a bad night in the kitchen seem a lot better!! Glad the soup came out good! Love ya!! Haha yes, it is the one you gave me. I had no idea they had so many parts! Oh well. And yes, as soon as I have the counter space for it, I’m for sure getting a Kitchen Aid. Either that or I’ll just end up with really strong arms. Love you! This looks absolutely delicious as I love veges anyway! A must try! I recently threw out a mini hand chopper because I was so frustrated with it – sometimes doing things by hand is the most reliable! The bread is edible and makes good toast, but it’s a little dense and chewy. It’s got like 3 cups of dried fruit and seeds in it, so I think it would taste decent regardless of how the bread dough came out. I think bread has a steep learning curve! Trevor has been making a batch of sourdough every week for the last few months and he’s still not happy with it (although I think it’s delicious). I hope your next batch comes out well!! Those types of kitchen days can certainly be frustrating! I purchased a mandolin two years ago and I’ve used it ONCE. You’re right…it took me a good hour to figure out how to put it all together and make it work properly. I even labeled all the parts so I would know what to do next time. Unfortunately, every time I look at it now I think, “ugh”..no thanks, I’ll just slice everything thinly by hand. Ha! I had no idea they had so many parts! I think my reaction to it will probably be along the “ugh” lines in the future too – I’ll just work on my chopping skills. Same here. Can not for the life of me get bread making under control. I have given up after last weekends hockey pucks. :) You soup looks delicious and I love how you only used five ingredients. Mmm this looks really good. I’m a sucker for anything with curry flavoring! The soup sounds so delicious. Even worth braving the blender for! I’m writing it down right now so I can give it a try. This soup sounds amazing! I want to reach in and grab that spoon and take a bite out of that soup. Delicious! We’ve had several weeks like what you describe. Looks like you rallied though—pretty soup.